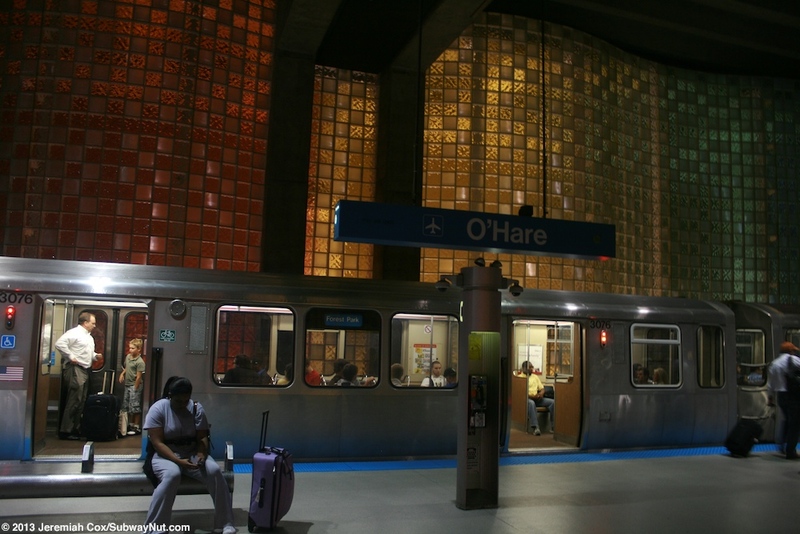 The 'L' station is located beneath the main parking garage in the middle of the central terminal area that the original three terminals 1 (rebuilt in the 1980s), 2, and 3 form a semicircle around the train station. These terminals are connected by walkways both airside and landslide along the airport roadway. 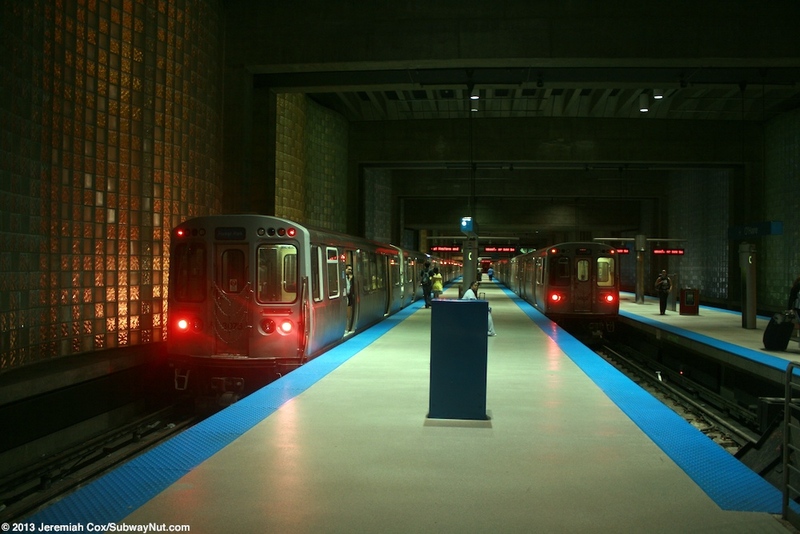 The station has three tracks with two island platforms allowing trains on the central platform to open their doors on both sides. 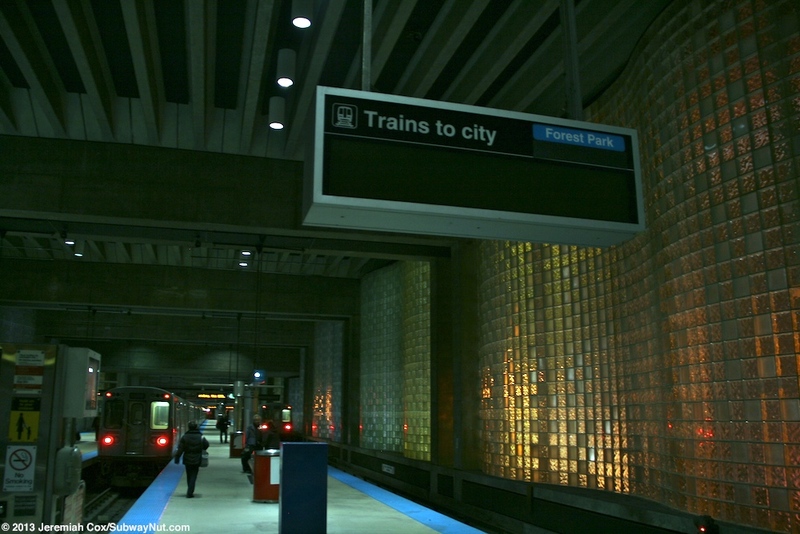 The station has a tall vaulted ceiling that lacks any interior support columns and has neat wavy looking glass along the track walls. 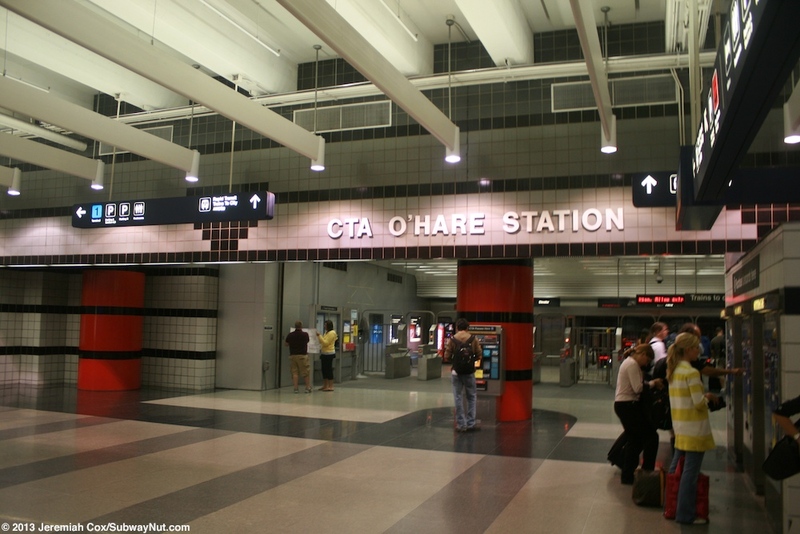 Unique blue signs that say O'Hare and then the Airport Symbol hang from the rafters of this ceiling. 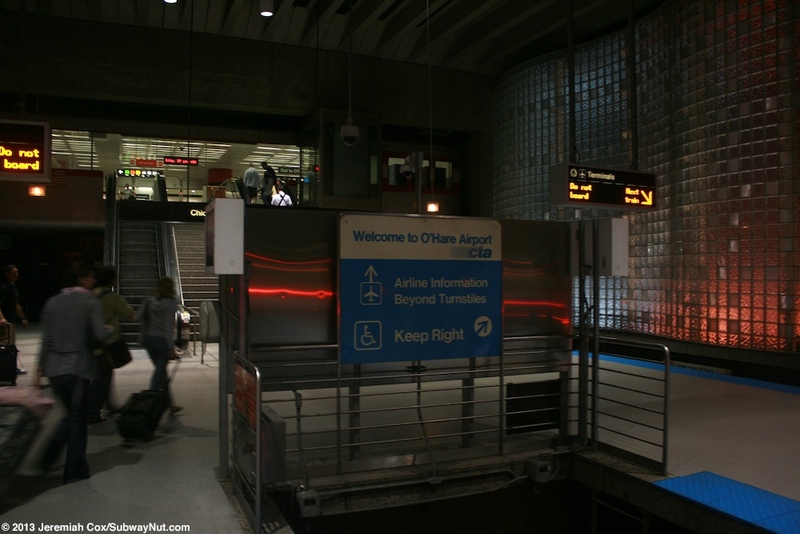 No geographic coordinates are given for the station because it has no access to the street grid (I believe there is no legal way to walk out of O'Hare Airport). 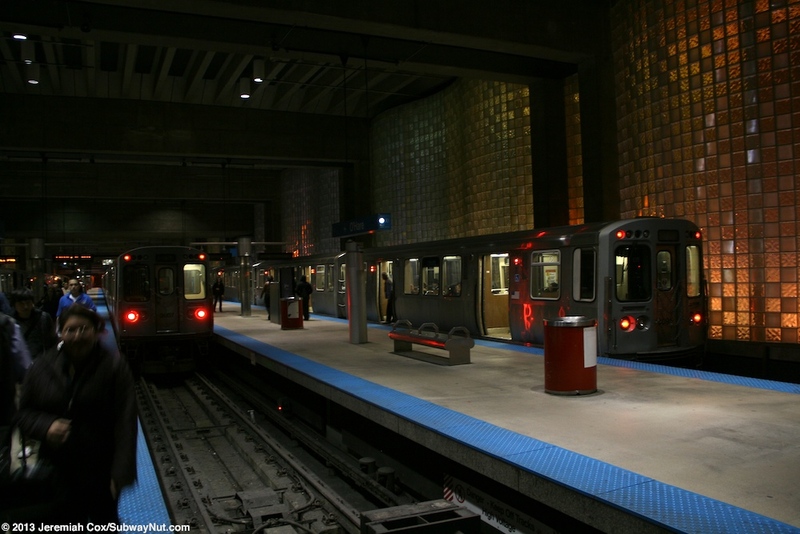 Trains relay before entering the station because at the western end of the platforms beyond the bumper blocks they form one wide platform. 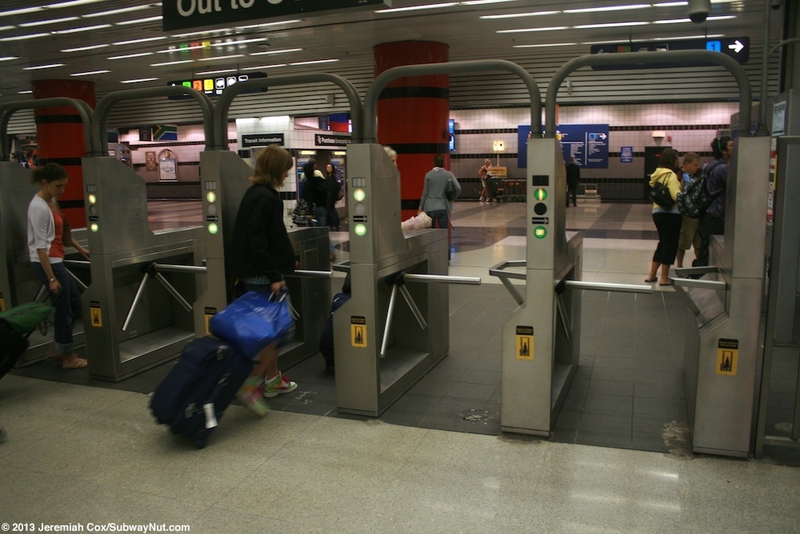 From here there are two escalators with stairs and an elevator that lead up to an intermediate level (the ceiling stays the same height) before arriving at the wide fare control area, there are many extra wide turnstiles and entering and leaving passengers are separated by signs and the turnstiles displaying yes or no entry. 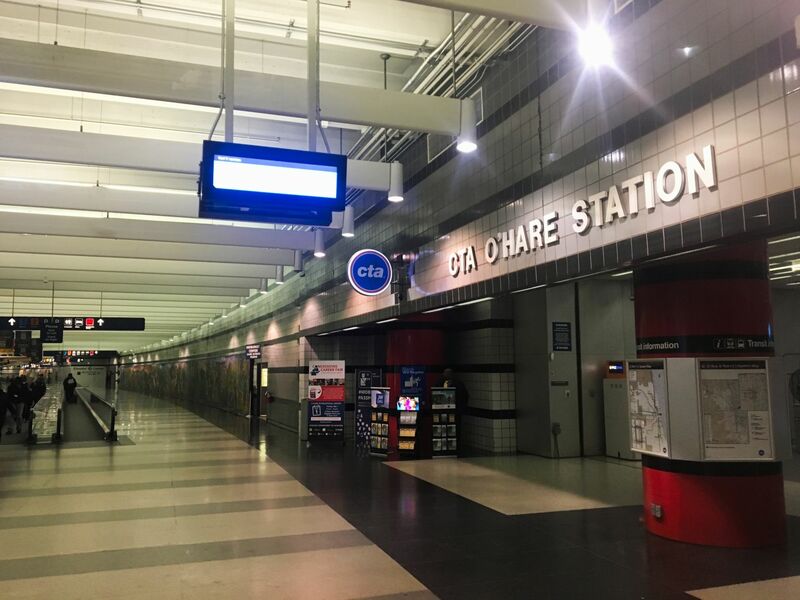 There are plenty of all three types of CTA FVMs (regular cash ones, credit, and pass vending machines) and staff to help out of town travelers. 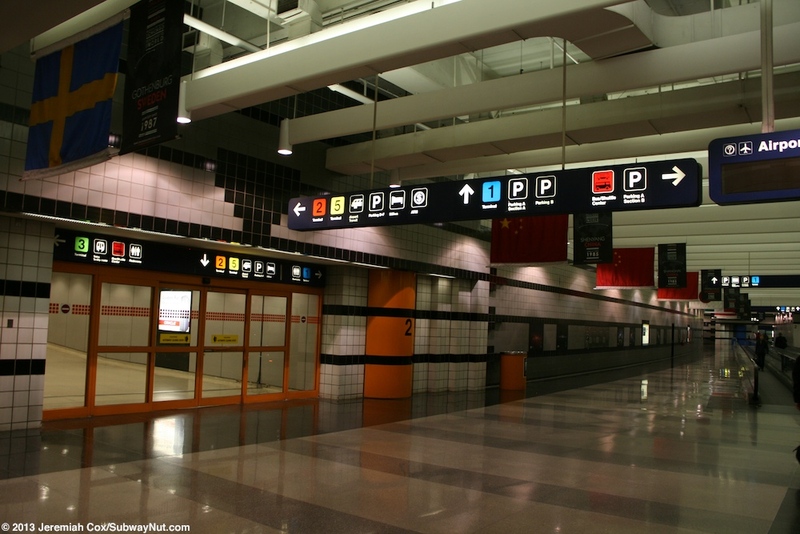 The station is directly beneath the central Bus/Shuttle Center, the pick-up facility for Regional Buses, which is on the Ground Level of the Parking garage (and was formerly International Terminal 4 that served all international flights from 1983-1993 busing passengers to and from their aircraft). 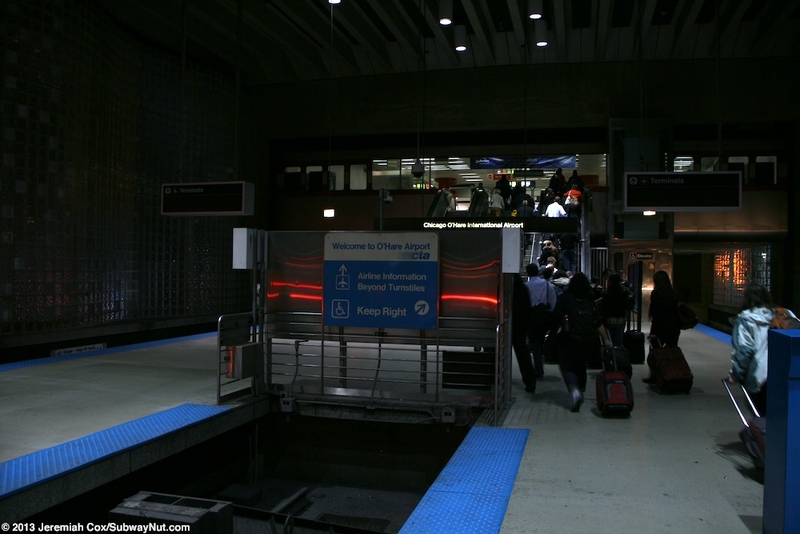 To reach terminals 1, 2, or 3 from the 'L' station there are two underground moving walkway corridors beneath the parking garage, airport hotel, and inter-airport roadways to each of the three different terminals. 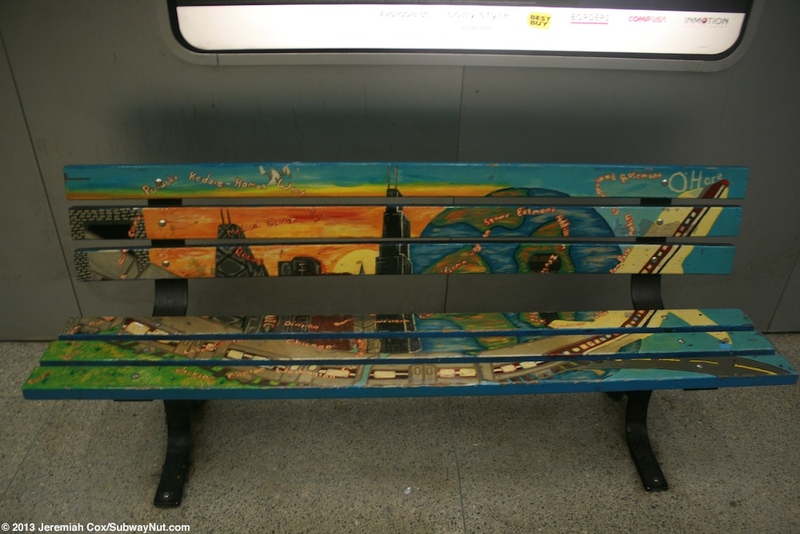 The walkway to Terminal 2 is the shortest and passengers needing the ATS or Terminal 5 are signed to go this way from the rail station. 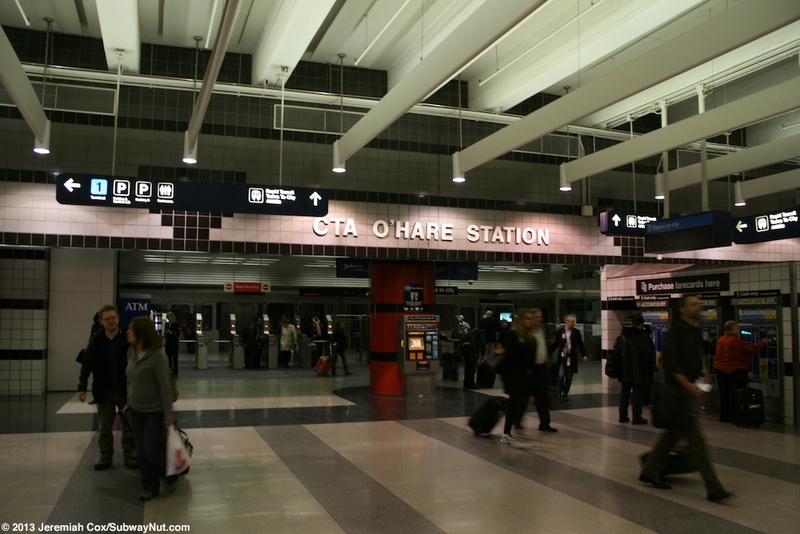 O'Hare opened a new terminal, International Terminal 5, since the train station opened in 1993. 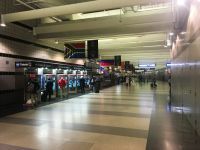 This terminal is a mile away and totally separate from the main terminal area. 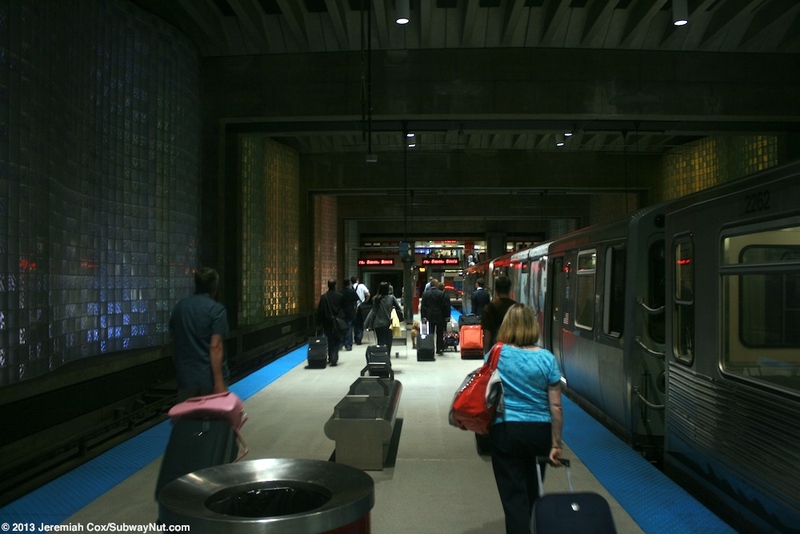 To drive to it cars must use the Kennedy Expressway (here I-290) which ends at the Airport. Although CTA trains pass relatively close to this terminal, with just lanes of the Kennedy Expressway (trains have already emerged from their tunnel and entered its median) and the terminal's parking lot in the way, there are no plans to build it its own CTA Station. The Airport Transit System (ATS) instead (which opened at the same time as the new terminal) does the job. 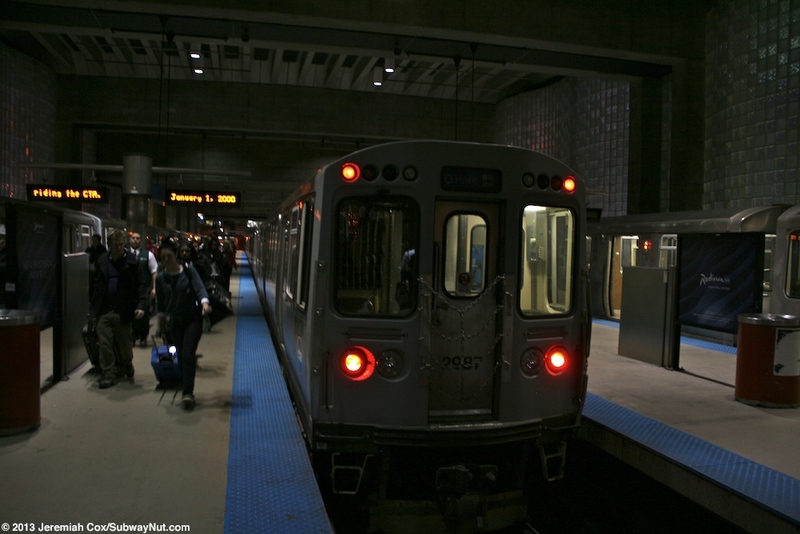 This is a VAL Rubber Tired People Mover system that runs first around the central terminal area with stops for 1, 2, 3 before running out to Terminal 5 parallel to and clearly visible from the CTA tracks with just half of the Kennedy Expressway in between and then curving north over the CTA Tracks to its final Remote Parking/Kiss'n'Fly Station. 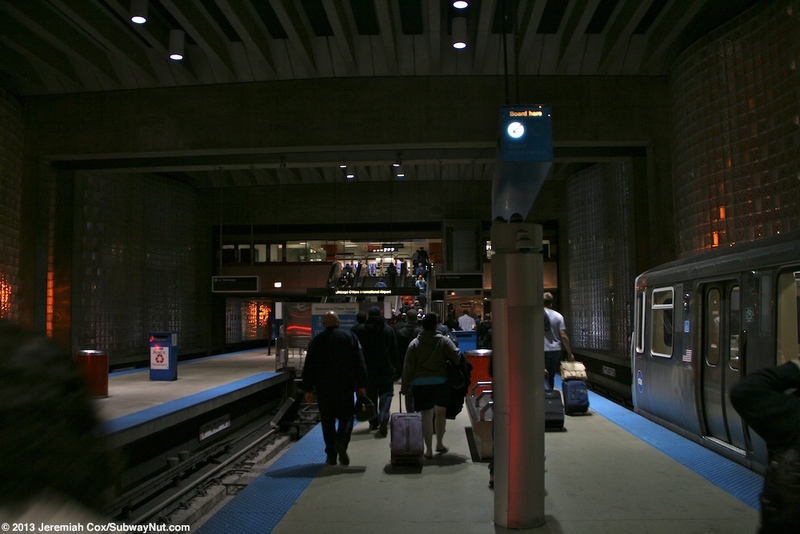 This remote parking station includes another attempt at faster train service. 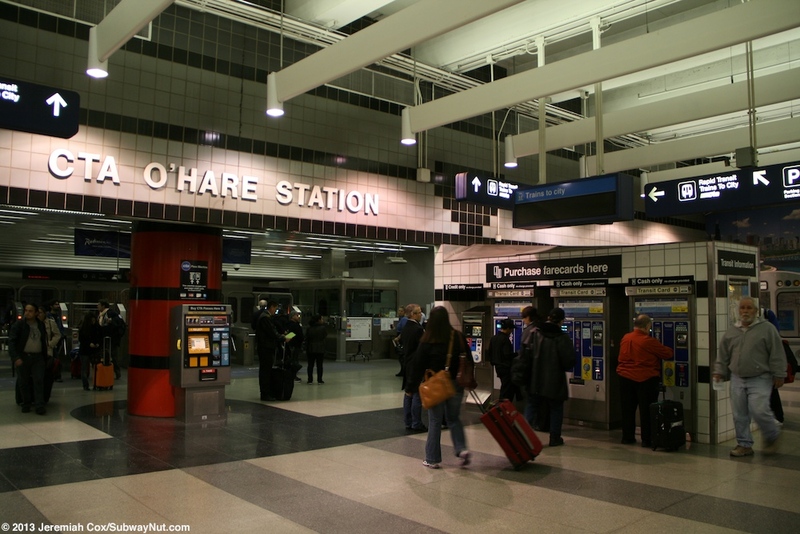 Here passengers can connect to a shuttle bus (specifically the one that serves parking lot F and must make all the stops in that parking lot) to the Metra O'Hare Transfer Station which opened in 1996 on Metra's North Central Service. 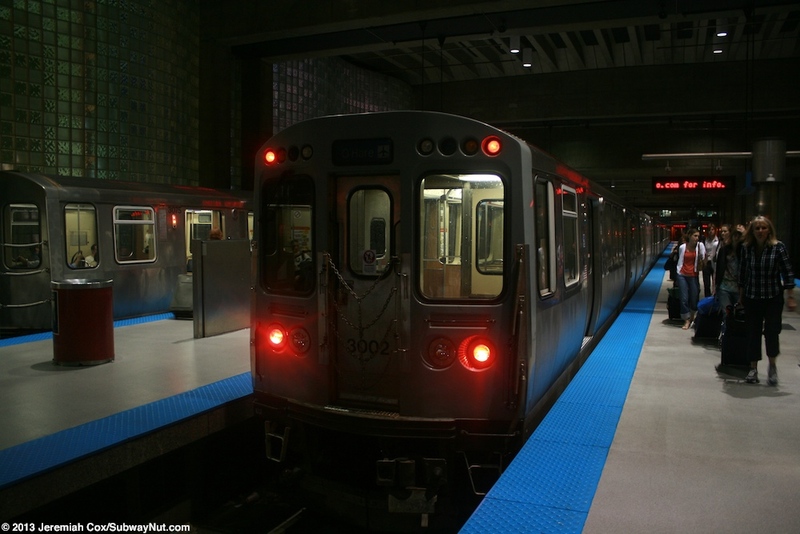 This train through makes just ten weekday round-trips taking about 30 minutes to and from Union Station. 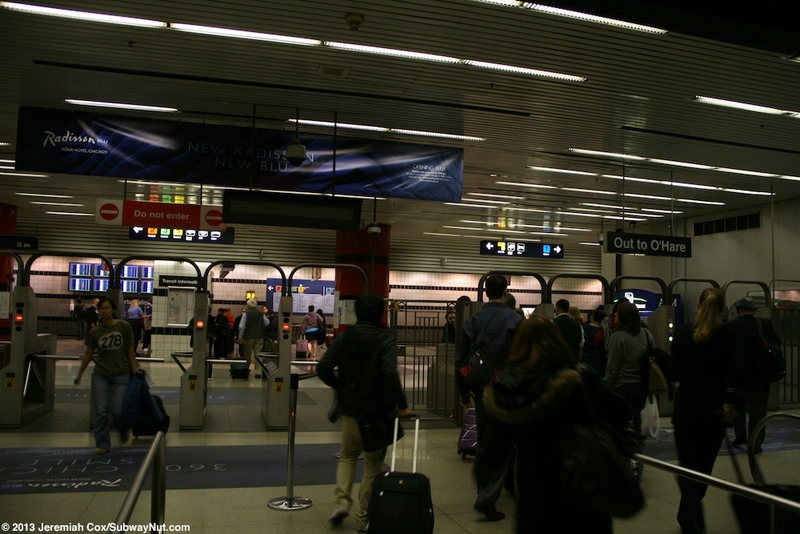 The Remote Parking/Kiss'n'Fly Station is also where two PACE buses that serve the airport (one runs all the way to Skokie, connecting with the Swift and then Evanston) terminate and don't pull into the terminal area.